The ‘How Great Things Age‘ series celebrates and examines how quality menswear ages over time. Often, it becomes more beautiful, though different materials from leather to cotton to board age in very different ways. The last two we featured – a Levi’s big-E jacket and a Barbour motorcycle jacket – were vintage items, rather than things I had aged myself through wearing. This instalment, then, is a return to more personal pieces – such as the Edward Green Oundles (the first quality pair of shoes I ever owned) and Globe-Trotter suitcase. Regular readers will be familiar with this leather jacket, which was made bespoke for me by Davide Taub at Gieves & Hawkes. As well as being cut and fitted by hand, it had a padded, jacket-style shoulder which set it apart construction-wise from anything off the peg. It’s only been two years, but the jacket’s calf leather has darkened significantly, as I’d hoped it would. Veg-tanned leather will normally acquire a patina in this way, but without specific knowledge of the tannery or evidence of pieces made in its leather, it’s very hard to know exactly how it will age. When we say patina, of course, we mean dirt. 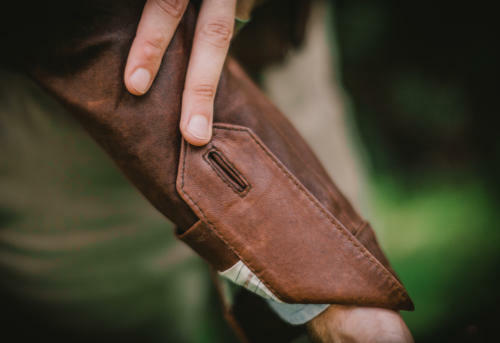 Leather builds up atmospheric dirt, and then darkens more in places where it comes into contact with dirty surfaces – the elbows, top of the back, bottom edge. Or indeed with your own skin, on the fold of the collar or the bottom of the zip. As the whole skin settles into a darker tone, this ageing will slow down, but it will continue to change colour indefinitely. A reader made the comment a while ago that the jacket’s cut makes it slightly more of a fashion piece. I agree: the bespoke cut is quite form fitting, and most leather blousons would use ribbing around the waist to keep it tight, expanding into a much more generous fit around the waist. But this cut has more in common with motorcycle jackets, which of course were always cut close to reduce wind resistance and retain warmth. It doesn’t have an asymmetric zip, or quick-access external pockets, but the shape is very similar. That ageing is also now a big factor in how it looks. The blackness of the elbow and chest, as well as the wrinkled texturing everywhere, give a touch more ruggedness. Beautiful and more personal, certainly. And hopefully it will only get greater as it ages more. 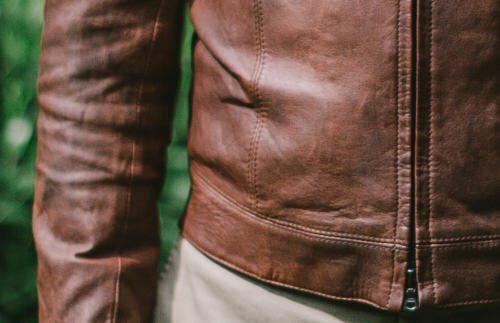 You can follow the discussion on How great things age: Bespoke leather jacket by entering your email address in the box below. You will then receive an email every time a new comment is added. These will also contain a link to a page where you can stop the alerts, and remove all of your related data from the site. Now however it looks amazing. If only you could by a jacket with that Patina RTW. This is a perfectly nice casual piece. I’m only struggling to see the benefit of going bespoke for something that you shrug on with jeans and a t-shirt. Considering the cost, wouldn’t a bespoke sports jacket have been a more worthwhile investment and a better use of Mr Taub’s skills? The issue is that you could never get a fit like this RTW, Mac. Sorry, when I used the word slouchy, I meant informal and relaxed, which is what I think your jacket and mine are. Simon already has pleanty of exquisite bespoke sports jackets. I thoigh getting a cutter with a flair for the unusual to make this jacket was a very good move at the time. This post re-enforcing my views – it’s stunning. BTW Simon how is the gillet commission comming along? I’m very curious to see how it turns out. But it does not fit that well at all anyhow so, as Mac stated, a waste of time getting this bespoke. It’s got different arm lengths; is loose around the neck, and is sloppy in the shoulders. Probably best to agree to differ etc. Not sure where HAK is coming from. He seems to have an ax grind with you, Simon. On this kind of a jacket (or any kind of moto/biker leather) it’s de rigueur to have sleeves of this length. The shoulders are near perfect not “sloppy” — they sit as naturally and smoothly as shoulders on a leather jacket can sit. Finally the “neck being loose” – well, there’s some room towards the front of the chest – but there’s really no “neck” to speak of – and certainly no gape to it. Not sure why you took the bait, Simon. It’s like someone saying an empirically beautiful woman is not beautiful. I think it’s a great jacket and the fit is superb. 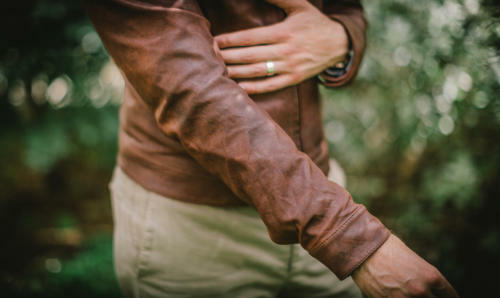 Sleeve lengths on rtw leather jackets always seem to be too long for me and v difficult to alter. But out of interest, could you tell us how much it cost? Surely got to be a major factor in deciding whether bespoke is worth it for casual wear….? Great value given the RTW alternatives; just imagine how it will look in a decade. Well done. Am I looking at different photographs from the moaners here? I think it looks really good. It has a simplicity that means it will only get better and better over the years – when you see these things on the rails many of the have adornments that just detract from the piece. £4.3k is big but I reckon this will be around for a long time and will outlive many of the other commissions. For those with shallower pockets I was actually recommended wested leather by someone. Have not tried them myself yet however. They are the makers of the original Indiana Jones jacket and various others. They can do bespoke with a pattern and trial jacket for a fraction of that. I think it’s pointless to criticise the garment or its quality of fit. Simon’s happy which is all that counts. The fact remains that you’d be paying £4300 to wear this to the supermarket or down the pub! I wouldn’t know it was bespoke if it wasn’t stated above. I assume it’s uncanvassed? It has a soft shoulder line etc. It doesn’t look ‘tailored’. I’m not criticising the garment itself. It does its job very well. For me, It’s only about what you could buy for the same money. Depends how much you like casual clothing. I find casual clothes depressing. Everyone seems to wear them. I find the color of this jacket lovely. This is a beautiful piece that is being really enhanced with age. That said, although I live a mostly informal life, I never find an opportunity to wear leather. I almost invariably finish up preferring another alternative. When it is not raining I prefer corduroy or cashmere. When it is, I go for my Lora Piana storm system travel jacket. Perhaps if I lived in California or had a motorcycle? Also, I have to admit, the leather jacket is an item that should be treated with considerable caution by the elegantly ageing hipster. Simon, although two years after purchase is as good a time as any to reflect on the jacket for the purposes of this blog (and it looks great by the way), I suspect that the real pleasure will come in 10, 20, 30 years time every time you pull the item out of your wardrobe, and that is priceless. Of course £4,300 is a significant amount of money, but if it lasts five times as long as a jacket that you replace every five years with like for like, therein lies the value. Mac – do you never partake in casual activities and pastimes which demand appropriately casual clothing? I’m wearing casual clothes today. They’re great if you’re going the supermarket or shopping in Oxford Street in London. I just see no need to spend a lot of money on something ordinary or utilitarian. Bespoke jeans or leather jackets seem rather futile and unnecessary. What next? Vicuna boxer shorts? Everyone seems to have an opinion on this so I think I’ll share mine. I think the jacket’s an impressive piece of work and I’ve no doubt that the fit, make and leather is absolutely first rate. But, It just doesn’t appeal to me personally. It looks very short, very fitted and not that comfortable. 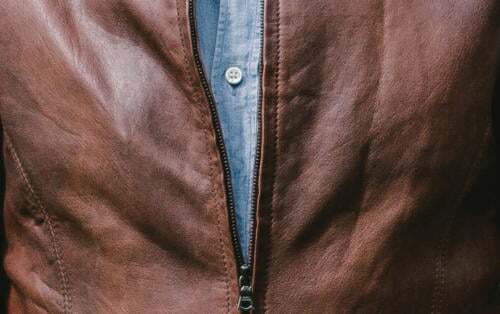 For me the appeal of a leather jacket lies in its dependability as something substantial that can be thrown on with jeans and a t-shirt or shirt. I think their character is often derived from the idiosyncrasies in their shape and fit. Obviously they should be the right size, but where they’re so fitted as this it looks neither casual nor formal. I’m not sure when I would choose to wear such an item. It’s still an enormously interesting commission though and I thank you for sharing, as always. Great for doing the gardening. 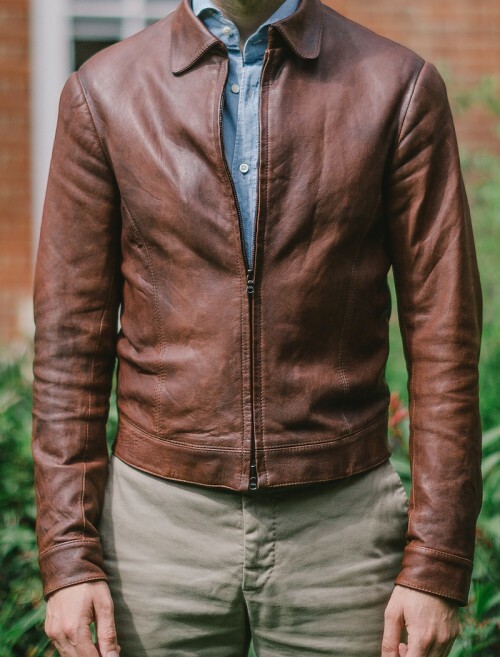 Whatever anyone’s opinion of this jacket and it’s worth / value (as I said in my first comment I now think this jacket has grown into something that looks amazing and would love to own, albeit with pockets) the point of this blog is to show luxury at its highest standard. If Simon went “I bought this lovely bellstaff leather jacket but David and gieves will make you something nicer” it would not be for this blog. quite frankly as someone who only occasionally wears suits it is great to have casual inspiration. I’m not going to spend £4K on a leather jacket (not for many years anyway!) but like many of us I will take inspiration and knowledge and use than when I go shopping. Simon, hope you don’t mind me commenting on an old post. I’ve been in touch with Cromford lately about purchasing a leather jacket. I’m likely to go down the MTM route but am struggling to reconcile colour and weight/thickness of material. They have an oxblood lamb nappa (Murphy on their website but I’m going for the De Niro style) which is a beautiful colour but softer/more supple than my other option – a tan cow hide (Caine), also in the De Niro style. I’m going to wear the jacket primarily as casual e.g. with jeans and my feeling is that a soft skin is going to look too ‘polished’ for jeans wear. Grateful for your thoughts. How ‘beefy’ was your G&H jacket? Not at all, comments on old posts are great! I would agree, the nappa is going to be too shiny and smooth for jeans most of the time. My G&H leather was a little rougher and had less of a finish than that – so it has aged quickly. I’d go with the tan cow hide. Thank you, that’s really helpful! Simon, could you confirm please the type of leather in your jacket. Seem to have read Italian Mid Brown Nappa, Veg Tan? Also do you know the tannery the leather came from? I am thinking of having Cromford make me a jacket, current refining my specs. I am happy to take the time for the leather to age, still have a leather jacket purchased in London in the early 80’s…i am a “bit” bigger now if you know what i mean. You’re right on the leather, but no I don’t have the tannery I’m afraid.